In the late 90's, archeologists discovered the resting place of the French ship La Belle — one of ships from Robert de La Salle's 17th century expedition — on the floor of Matagorda Bay. After a state-of-the-art recovery mission, they unearthed a preserved section of the ship's hull and over one million artifacts virtually in the same state as they had been packed and loaded onto the ship over 300 hundered years ago. Beginning in the next several months and wrapping up in 2013, The Bullock Texas State History Museum will transform the first floor of the museum into a new permanent exhibit centered around the reconstruction of the actual hull of the ship. There will also be a companion exhibit that will travel around the North America and ultimately France. 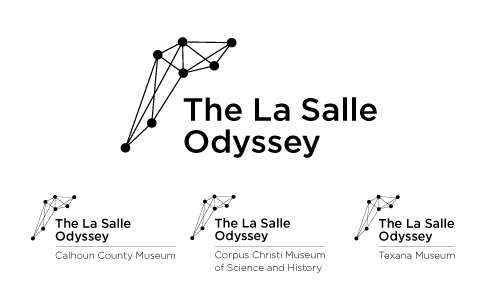 In addition to the exhibit identity we also proposed an identity system that is still under review but is intended to provide for a unified look and feel across the seven La Salle Odyssey Museums in Southeast Texas. These museusm each have ownership of several important artifacts from the shipwreck that will be included in the travelling exhibit and vary in size from large, establishes museums to small, completely volunteer operations.